The filter passes its intensity input through unmodified. The filter is threaded. Definition at line 59 of file itkLabelStatisticsImageFilter.h. Definition at line 105 of file itkLabelStatisticsImageFilter.h. Definition at line 69 of file itkLabelStatisticsImageFilter.h. Definition at line 99 of file itkLabelStatisticsImageFilter.h. Definition at line 109 of file itkLabelStatisticsImageFilter.h. Definition at line 108 of file itkLabelStatisticsImageFilter.h. Definition at line 81 of file itkLabelStatisticsImageFilter.h. Definition at line 78 of file itkLabelStatisticsImageFilter.h. Definition at line 86 of file itkLabelStatisticsImageFilter.h. Label image related type alias. Definition at line 85 of file itkLabelStatisticsImageFilter.h. Definition at line 89 of file itkLabelStatisticsImageFilter.h. Definition at line 90 of file itkLabelStatisticsImageFilter.h. Definition at line 87 of file itkLabelStatisticsImageFilter.h. Definition at line 88 of file itkLabelStatisticsImageFilter.h. Definition at line 237 of file itkLabelStatisticsImageFilter.h. Definition at line 236 of file itkLabelStatisticsImageFilter.h. Definition at line 238 of file itkLabelStatisticsImageFilter.h. Definition at line 235 of file itkLabelStatisticsImageFilter.h. Definition at line 82 of file itkLabelStatisticsImageFilter.h. Definition at line 68 of file itkLabelStatisticsImageFilter.h. Definition at line 102 of file itkLabelStatisticsImageFilter.h. Type to use for computations. Definition at line 96 of file itkLabelStatisticsImageFilter.h. Definition at line 79 of file itkLabelStatisticsImageFilter.h. Definition at line 66 of file itkLabelStatisticsImageFilter.h. Definition at line 80 of file itkLabelStatisticsImageFilter.h. Definition at line 67 of file itkLabelStatisticsImageFilter.h. Definition at line 241 of file itkLabelStatisticsImageFilter.h. Do final mean and variance computation from data accumulated in threads. 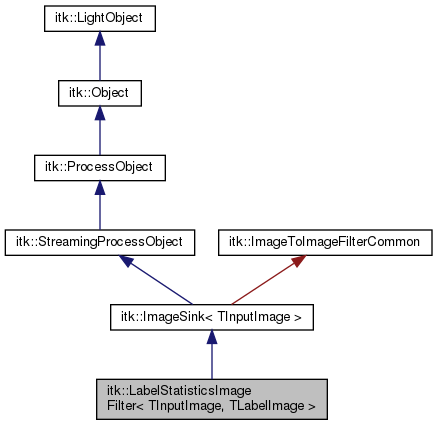 Reimplemented from itk::ImageSource< TInputImage >. Pass the input through unmodified. Do this by Grafting in the AllocateOutputs method. Definition at line 262 of file itkLabelStatisticsImageFilter.h. Reimplemented from itk::ImageToImageFilter< TInputImage, TInputImage >. Definition at line 280 of file itkLabelStatisticsImageFilter.h. Definition at line 275 of file itkLabelStatisticsImageFilter.h. Definition at line 249 of file itkLabelStatisticsImageFilter.h. Definition at line 269 of file itkLabelStatisticsImageFilter.h. Definition at line 255 of file itkLabelStatisticsImageFilter.h. Definition at line 93 of file itkLabelStatisticsImageFilter.h. Definition at line 354 of file itkLabelStatisticsImageFilter.h. Definition at line 361 of file itkLabelStatisticsImageFilter.h. Definition at line 364 of file itkLabelStatisticsImageFilter.h. Definition at line 359 of file itkLabelStatisticsImageFilter.h. Definition at line 362 of file itkLabelStatisticsImageFilter.h. Definition at line 357 of file itkLabelStatisticsImageFilter.h. Definition at line 355 of file itkLabelStatisticsImageFilter.h.